The Daily Telegraph has been censured by press watchdog IPSO after republishing a 2009 front page which implicated former Prime Minister Gordon Brown in abuse of parliamentary expenses. 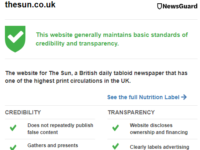 The newspaper was ordered to publish a correction and apology by the Independent Press Standards Organisation (IPSO) and to publish a critical adjudication. 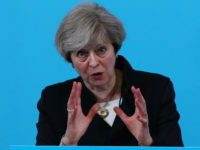 The paper used a small image of its front page scoop breaking news of the expenses scandal, which it claimed had become “iconic”, in an article setting out its opposition to Section 40 of the Crime and Courts Act being enacted. Under Section 40 newspapers could be forced to pay court costs for both sides in legal battles, even if they win. 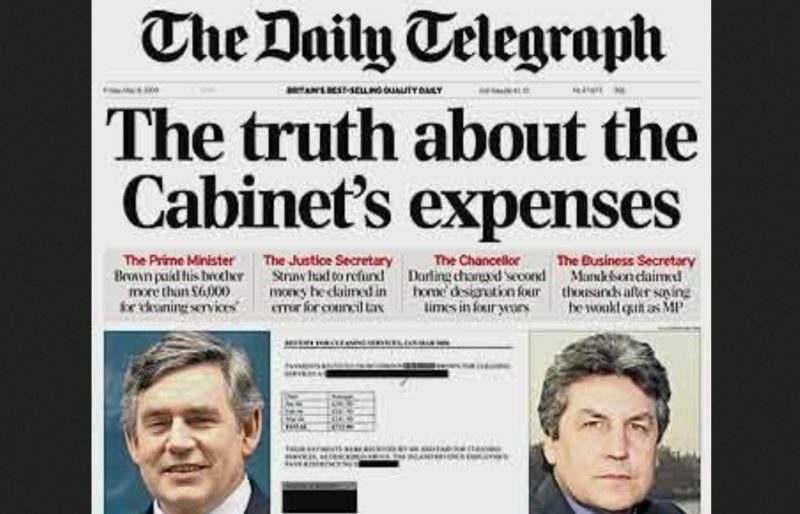 The rag-out front-page image included the headline: “The truth about the Cabinet’s expenses,” and sub-headline: “Brown paid his brother more than £6,000 for ‘cleaning expenses,” from a Telegraph story published in 2009. An image of Brown and his brother Andrew was included in the image, which sat alongside two front pages from other newspapers as illustrations of public interest journalism. The article was also published online on 23 December 2016, but the image of the Telegraph’s front page was cropped to omit the lower section of the story. Brown complained to IPSO that republication of the 2009 story in this way represented a breach of Clause 1, accuracy, of the Editor’s Code of Practice. He said the article had failed to make clear that following the original publication of this story, the newspaper had accepted that it had inaccurately reported that he and his brother had abused the MPs’ expenses system and had agreed to publish a correction. He said that the republication of the front page in the context of the new article about public interest journalism had given the “significantly misleading impression” that he was an example of someone “whose wrongdoing was exposed”. 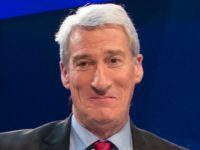 Brown also expressed concern that the article had been tweeted by the newspaper, and an image of the article, including his picture, remained on its Facebook page even at the end of IPSO’s investigation. Brown told IPSO the newspaper “had made him a poster boy for press exposure of very serious and appalling wrongdoing”. The Telegraph said it did not believe its 2009 front page had given the impression that it had exposed the complainant engaging in wrongdoing. It said that its earlier coverage of the complainant’s expenses claim had been both “fair and accurate”. It told IPSO it had “never accepted that there was any need for a correction or an apology” but rather it had offered to publish some additional wording as a clarification. IPSO’s complaints committee said the use of the complainant’s image under the heading “The truth about the cabinet’s expenses” in this context had given the significantly misleading impression that he was one of those MPs who had been found to have abused the expenses system. It said the use of inverted commas in the sub-headline to the 2009 article had suggested that he had paid his brother for cleaning services improperly. It said that given the Telegraph had accepted in 2009 that Brown had not been guilty of any wrongdoing in relation to the payment to his brother for cleaning expenses, the repeated use of his image in this context represented a “serious failure to take care over the accuracy of the article” in breach of Clause 1 and required a correction. Two days after Brown contacted the newspaper to express his concerns about the article, the Telegraph offered to publish a correction in print, 16 pages further forward than the original article had appeared, and amended the online article. 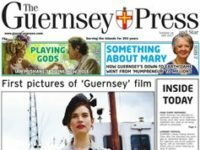 IPSO said this was a “serious, unjustified, allegation” and required an apology and that the newspaper’s failure to apologise was a further breach of the code. IPSO upheld the complaint and ordered the Daily Telegraph to carry a 526-word correction and clarification. 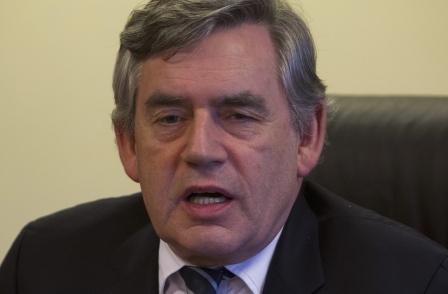 Following an article published in the Daily Telegraph on 24 and 27 December 2016, headlined “’For hundreds of years, Britain’s commitment to a free press has helped make this country a beacon of freedom for the world…But all this is now under threat from MPs and Lords’”, Gordon Brown complained to the Independent Press Standards Organisation that the Daily Telegraph breached Clause 1 (Accuracy) of the Editors’ Code of Practice. IPSO upheld the complaint and has required the Daily Telegraph to publish this decision as a remedy to the breach. The article said that the freedom of the press was under threat from the possible enforcement of Section 40 of the Crime and Courts Act 2013. It said that Section 40 would “make it impossible to conduct serious investigative journalism, since people whose wrongdoing was exposed would be able to bring ruinously expensive legal actions against newspapers”. It said that it was “only because of the Telegraph that voters learned how MPs were abusing their expenses”. The piece was illustrated by three small images of front-page stories, including the Daily Telegraph’s first front page relating to the expenses scandal, which was headlined “The truth about the Cabinet’s expenses” and included an image of the complainant and his brother. The complainant said that the publication of the image of the 2009 article, which included his and his brother’s photographs and stated “Brown paid his brother more than £6,000 for ‘cleaning expenses’” had given the significantly misleading impression that he was an example of someone “whose wrongdoing was exposed”. The article had failed to make clear that following the original publication of this story, the newspaper had accepted that it had inaccurately reported that he and his brother had abused the MPs’ expenses system, and it had agreed to publish a correction. The newspaper had failed to correct this further inaccuracy promptly, and the correction it had offered to publish had failed to include an apology. The newspaper said that the image under complaint was one of three partial front covers used as generic examples of public interest journalism. Its use of this front page had not given the impression that it had exposed the complainant engaging in wrongdoing; the article was not about the complainant; it was about the threat to freedom of expression and the free press. 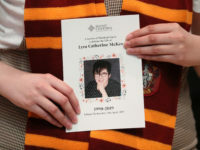 The newspaper said that the 2009 coverage of the complainant’s cleaning expenses claim had been both fair and accurate. It had never accepted that there was any need for a correction or an apology; rather, it had offered to publish some additional wording as a clarification. The Committee considered that the use of the complainant’s image to illustrate a piece which referred to MPs “abusing their expenses” had given the significantly misleading impression that he was one of those MPs who had been found to have abused the expenses system. While the newspaper had offered to publish a correction promptly, it had failed to acknowledge that it had effectively made a fresh allegation of “abuse” against the complainant. This was a serious, unjustified allegation, and an apology was required under the terms of the Code. The complaint was upheld. Mud sticks, always. And it costs nothing to reprint an apology, however many times they are forced to do it. How long have the Barclays owned the Telegraph now?